James McCann’s newest book on malaria, agriculture, and ecology in Ethiopia is a superb and rich study. McCann helps fill many gaps in scholarship, including the grossly overlooked history of medicine in Ethiopia. The book narrates malaria in Ethiopia in both the past and present, demonstrating how this ever-evolving, clever disease has shifted with the ecological and political landscape of the nation. To understand malaria today, McCann rightly demonstrates how an exploration of the past is essential. Unfortunately, there is very little written about Ethiopia’s medical history – Kloos and Zein’s Ecology of Health and Disease in Ethiopia (1993) is the most useful volume in an otherwise bleak academic landscape. McCann’s new study is a welcome start to what should be an expansion of research on past efforts to combat disease and install an effective public health network in the country. Because of Ethiopia’s unique ecological and political character – a highland nation, free of a colonial past – the challenges faced are unique in comparison to other African states. McCann’s rigorous exploration of Ethiopia’s ecological and agricultural histories, both in this and previous books, provides refreshing insights into this singular landscape. While this study is especially insightful for scholars of Ethiopia, it also provides a rigorous exploration of the failures to account for local ecology in the planning of disease management and control. This is a lesson worth exporting far outside both Ethiopia and even the specific case of malaria. McCann repeats often in the book how malaria is a deeply ‘local’ disease: the ways in which mosquitos breed and prey on human populations varies considerably based on ecological and political landscapes. While malaria ‘eradication’ efforts in the past century have been forged on a global scale, most notably with DDT spraying and bed-nets, such efforts have all fallen severely short of their goals, largely because of the highly adaptive nature of the disease. There is no ‘one-size-fits-all’ approach to malaria eradication, and in some cases, the insertion of development programming itself can increase the risk of disease. Indeed, one of the most striking findings in the book is the relationship between increased maize production and the spread of malaria. McCann describes how mosquitoes thrive off the seed fall of maize plants, leading to a dramatic increase of malaria risk in highland zones of Ethiopia that were previously largely immune to malaria due to altitude. Large-scale maize production has been touted by international organizations as an answer to hunger and poverty in Africa, but this clearly has dangerous unintended consequences to the ecology of disease. McCann’s work is truly a must-read for experts in many fields, from public health, agriculture, and history, to politics and development. This book is a brilliant demonstration of the deeply local and highly adaptable nature of disease and mortality, and the ways in which the historical ecology of disease effects household decision-making and trends in food production and economic development on a national scale. A review copy of The Historical Ecology of Malaria in Ethiopia was kindly furnished by the Ohio University Press. Bereket Habte Selassie begins his short history of Emperor Haile Selassie with a caveat: he served in the late Emperor’s cabinet for over twenty years, both as Attorney General and in other ministerial offices. Given the author’s connection to Haile Selassie, it is not surprising that his biography of the independent Ethiopian ruler has tendencies towards hagiography. The numerous studies written on Haile Selassie so far have largely been divided into two camps: positive praise of the Emperor as visionary monarch, and detracting criticism of an autocratic ruler. While his personal approval of the Emperor is evident, Bereket largely manages to evade this polarized historiography, attempting to, in his words, provide a ‘well-rounded’ history of Haile Selassie, describing both his triumphs and failures in ruling independent Ethiopia in the pivotal moment of Africa’s decolonization. The volume is part of a new series of ‘Short Histories of Africa’ by the Ohio University Press. This is a promising series to help introduce the varied history of the African continent to a wider audience. Because of the brevity required in this series, Bereket cautions that he had to omit a great deal of history from his telling of Haile Selassie’s history. It is unfortunate, however, that he mostly omits the meaty history of the Emperor’s rule in the 1950s and 60s, concentrating largely on his long rise and fall from power. 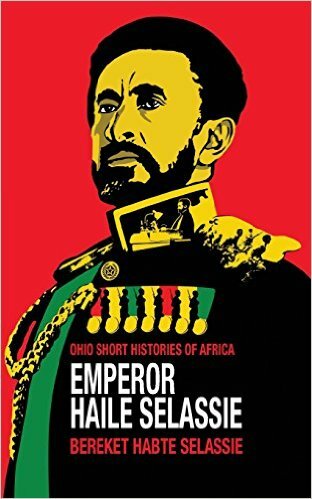 The first half of the book concentrates on the early years of Haile Selassie’s life, as Ras Tafari Makonnen, and the fraught power struggles which characterized his ascension to the throne. While this is in an interesting history, given the length of the book, it could have easily been summarized to make room for more discussion of the Emperor’s actual decades of rule. Bereket doesn’t question the concept of “modernization” itself within Ethiopia, largely agreeing with the superficial dictum which pits Haile Selassie’s “progressive” retinue against a “traditional” and even “backward” past. This lack of reflection is unfortunate, as there is much debate on the merits of modernity as a measure of “progress” in Africa at large. At the same time, anyone searching for a quick introduction to Ethiopia’s fascinating history could happily turn to Emperor Haile Selassie as a starting point. There is enough meat here to examine the history of the one “true independent African country,” written from the perspective of one of its elite history-makers. This review was kindly furnished by Ohio University Press. It’s been 30 years since this ridiculous excuse for a song was released. What have we learned in that time? Apparently nothing. Sometimes, if I’m in a particularly forgiving mood, I can come to a place where I understand the social and political context that would make someone in 1984 believe that releasing this song could be anything more than criminal noise pollution. But it’s really hard to forgive when you’re never allowed to forget! Every year I am thrown into an existential fit when I find myself in a car or shopping centre and this song begins to play. As the nausea sets in, I look around and wonder…is anyone else listening to this? Can you hear what they are saying? Is the DJ a robot? Is this real life?! …There’s a world outside your window, and it’s a world of dread and fear …Well tonight thank God it’s them instead of you …And there won’t be snow in Africa this Christmastime …Oh where nothing ever grows, no rain or rivers glow …Do they know it’s Christmastime at all? This song, the context that produced it, and its legacy since then is an incredibly rich case study of all that is wrong with Western-led humanitarian discourse and practice. It all began with the famed BBC broadcast of Ethiopia’s famine on October 24, 1984, which reached an audience of over 470 million people worldwide. The broadcast included Michael Buerk reporting that it was “the closest thing to hell on earth”, a statement which was then complemented by Mohamed Amin’s graphic images of dead children and desolate land. The broadcast inspired a number of global fundraisers including Live Aid, which gave birth to the recording Do they Know It’s Christmas? And raise funds they did – millions of dollars in fact. But to what end and at what cost? Famine is a horrible thing, and the conditions that allowed it to occur and exacerbate in Ethiopia included a deadly mixture of unfavourable climate conditions in the North, political wilful blindness, and a complicated game of diplomatic chess. However, media and pop culture representations of the famine depicted the food crisis as a biblical plague swept over a nation that didn’t see it coming and hadn’t a darn clue of what to do about it. The result was not public political awareness, but rather, a unanimous sense of dumbfounded shock and horror. As it turned out, there was a lot to be gained from masking the complexity of the issue and playing on the consciences of the Western middle class masses. ‘All you have to do is buy this record’, ‘all you have to give is a dollar a day’, ‘just text SAVE to 5050’. It is a tantalizingly simple solution to what is constructed as a hopeless but simple problem. Live Aid gave birth to a form of populist humanitarian response that continues to raise millions of dollars worldwide. The reckless abandon that often ignites these campaigns is usually a guarantee that both the messaging and funds will be handled irresponsibly. Much has been said, and said again about the effects Western media representations have had in dehumanizing people from the African continent and shaping problematic foreign and domestic policies. Yet here we are, in November of 2014, just days after Bob Geldof excitedly announced that he will be remaking his horrible song with a new band of bright eyed pop stars – but this time in response to the Ebola outbreak. ‘Buy the song. Stop the virus’. It’s just that easy. Now some will quip, isn’t it better to do something rather than nothing? No. That mentality has, and will always remain, more to do about our need to feel good about ourselves than our desire to affect positive change. Social action is important, and North-to-South solidarity is possible, but only when our concern is matched with a commitment to stay informed and act responsibly. There are groups and individuals on the continent with ideas, solutions and opinions that deserve to be heard, but that will require the likes of Bob Geldof and company to pipe down. Every year, over 600,000 people die from heart disease in the United States, costing the nation over $108.9 billion annually. The main causes include diabetes, obesity, and poor diet, which are indicative of social, political and economic issues indigenous to the U.S. There are a number of organizations, initiatives and campaigns established to raise awareness and funds for heart disease, however none of them have seemed to require the offensive, parochial and sensationalized tactics used for African issues. Imagine that. Bob Geldof’s BandAid30 might just be another ill-informed and well-intentioned initiative (if you look at it under really really flattering lighting), or perhaps a publicity stunt with a healthy dose of self-righteousness. However suspect, the motivations of these artists are simply not the issue at hand. Thoughtless media representations will continue to wreak havoc on Africa long after Ebola has subsided, just as they continue to do so thirty years after the famine. Thankfully, it is no longer 1984, and technological advances have created a number of global platforms for counter-representations from the Continent to stand upon. Unfortunately, there is still a fundamental power imbalance that means that these alternative – and far more relevant – perspectives will have to struggle to be heard. So BandAid30…clear the airspace, pause, listen, then respond – or please don’t respond at all. As I stood in line ready to enter the Oxford Playhouse, I overheard the conversation between the staff person collecting tickets and a father and daughter who stood before me in the line. She warned the father that she was advising all guests with children that the play included strong language and difficult situations. Undeterred by the warning, the man smiled politely, lovingly put his hand on the shoulder of his adolescent daughter and proudly proclaimed, “That’s alright, she read the book. And she’s lived in Africa before, she’s seen real refugees”. 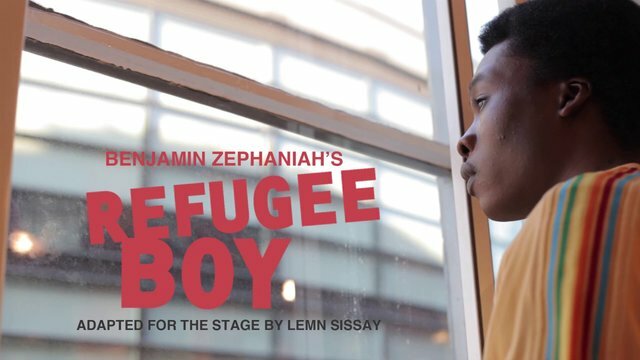 Refugee Boy is a theatre production based on the teen novel written by Benjamin Zephaniah and adapted for the stage by Lemn Sissay. The story follows Alem Kelo, a fourteen-year-old boy of Ethiopian and Eritrean descent who is seeking asylum in England. Before coming to England, Alem and his parents were forced to move between Ethiopia and Eritrea as the border war intensified and identity politics devolved into increasing violence. After managing to find a way to travel to the UK, Alem’s parents decide to leave him to be cared for by the British state as they continued their peacebuilding efforts in East Africa, and with the hopes that they would be reunited some day. After a difficult time in a children’s group home, Alem is eventually placed with a foster family, where much of the story then unfolds. Anyone familiar with the work of Lemn Sissay will notice his fingerprints through the rhythm and poetics of the characters’ dialogue. I have admittedly not read Benjamin Zephaniah’s original novel, but I imagine much of the grit and humour in the play can be attributed to Lemn’s adaptation. Lemn Sissay is a British poet and author of Ethiopian and Eritrean descent. Much like the play’s protagonist, Lemn grew up in the British foster care system after he was given up by his birth parents. I am certain that Lemn had a compendium of memories to draw from as he helped to tell the story of a young boy coming of age in a state of flux, uncertainty, and adversity. This scene happens early in the play, as Alem tries to fight off a bully at the children’s home he is initially placed in. Ultimately his is pinned down, runs out of options, and is coerced into saying it. “I am a refugee boy”, he says in defeat. Moments later, in a dream-like vignette, Alem recites: “Ask me who I am again. Ask me where I’m from”. It is this tension between Alem-the-person and Alem-the-refugee that gripped me the most throughout the play. Alem fights vehemently to assert his individuality – refusing to abbreviate his name, preserving the memory of his homeland, and proclaiming his appreciation for Charles Dickens. He is however simultaneously thrust into the legal political bureaucracy that is the refugee adjudication system, where he must fight to be recognized as a refugee in order to earn his safety and freedom. My mind drifted back to the father and daughter at the entrance to the theatre. “She’s seen real refugees.” In the moment, I was instinctively put off by what I’m sure was meant as an innocuous and reassuring comment by the father. But at the end of the play, I was also struck by the irony of the fact that Alem spent so much effort trying to resist the homogeneity and objectification that so often accompanies the label ‘refugee’, yet it was exactly the ‘refugee experience’ that we came to the theatre to see. The Horn of Africa is a diverse region whose history has been punctuated by years of protracted conflict and rapid social and political change. While ‘refugee’ serves as a useful analytical and legal term to refer to the millions who have had to flea their homes, Alem reminds us that each of these refugees are people with individual stories, ambitions, challenges, and lives. The aristocrat who travelled to the US for university then decided to file for asylum status after the monarchy was overthrown. The young man from Eritrea full of hopes and dreams who boards a crowded boat destined for the Mediterranean seas. The young Somali girl sitting in a classroom in the same Kenyan refugee camp where she was born. These are all ‘real refugees’ in the strict sense of the term, but I imagine they’d all have very different stories to tell if we had tickets to see a play based on their lives. This week, Oxford’s Horn of Africa Seminar hosted Ian Campbell to present his research on the events surrounding both the assassination attempt on Italian commander Rodolfo Graziani in Addis Ababa, Ethiopia on 19 February 1937, and the reprisal killings and massacre that occurred in the days and months which followed. Ian presented a harrowing and detailed account of the extent of the massacre which resulted in the deaths of an estimated 18-20% of the population of Addis Ababa, the majority of whom were women and children. While Graziani lay in a coma at Ras Desta Hospital following the grenade attack, a killing force comprised of members the Italian Army, Black Shirts, and civilians was organised. Forces were loosed on the city as the Italians feared the grenades thrown at Graziani were a precursor to wide-scale Ethiopian insurrection. Ethiopian servants were dragged out of houses in the Greek and Armenian neighbourhoods of the city and shot in the street. Black Shirts began burning down whole residential sections of the city, targeting Ethiopian homes with the residents still inside, and throwing any babies or young children who tried to escape back onto the flames. Hundreds of intelligentsia and young Ethiopians were rounded up and shot opportunistically, despite their obvious lack of involvement in the plot against Graziani. 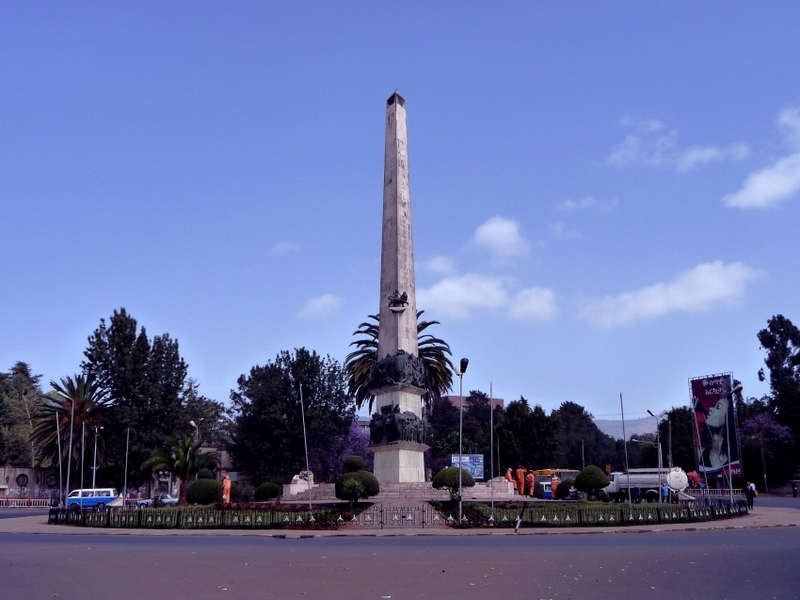 The killings in Addis went on for three days, until Mussolini himself sent orders to stop. Graziani emerged from his coma, but remained in recovery in hospital for months. Reprisal killings were then taken outside city borders – mobile gallows were erected and transported across the countryside, with the Italians targeting local aristocracy and community leaders. Graziani also targeted the Debre Libanos monastery for its symbolic link to the Orthodox church and Ethiopian cultural heritage, killing 3,000 monks, priests, and local residents. Ian Campbell has spent twenty years amassing documentary evidence on the extent of the reprisal killings in the months following February 1937. While the massacre has been memorialised in Addis at Yekatit 12 square in Siddist Kilo, the extent of the destruction has largely been hidden over the last decades. Ian has collected film and photographic evidence of the burnings and murders, the majority of which were taken by Black Shirts themselves as souvenirs of their time in Ethiopia. The photos were initially gathered by Sylvia Pankhurst for her anti-fascist newspaper, New Times and Ethiopia News, in addition to other foreign diplomats and Ethiopians living in Addis in the late 1930s. Ian has also unearthed critical documents within the national archives in Rome demonstrating that the massacre was deliberately planned and orchestrated by senior Italian leadership, and was not, as often asserted, a random act by a group of belligerent Black Shirts. Ian’s careful collection of evidence demonstrates the extent to which the full picture of this massacre has largely been erased from history, and the way in which its erasure has contributed to the myth of Italy’s “benign” occupation of Ethiopia. Why was such an atrocious series of events forgotten in time? Not only by the international community, but to a large extent by Ethiopians themselves? Ian argued that the forgetting was a deliberate political tool, both by prominent British politicians intent on securing Italy’s alliance at the end of World War II, and even Haile Selassie himself. The Emperor’s quick forgiveness of the Italian occupiers is striking given the widespread destruction, violence, and oppression they enacted in Ethiopia, but is symptomatic of Haile Selassie’s desire to merely move on and begin industrialising his reclaimed empire. Territorial disputes with the British, both Eritrea and the Somali Ogaden region, also left the Emperor with little choice but to capitulate to foreign pressure to not pursue justice against the Fascist occupiers. Post-war political juggling aside, the fact that no war crimes trials were conducted for the Italian occupiers of Ethiopia is striking, especially given the new evidence unearthed by Ian Campbell. His scholarship begs larger questions about the politics of memory in relation to acts of violence, especially in colonial contexts. In the wake of ongoing revelations about the extent of organised killings and brutality across colonial Africa, we must continue asking why certain acts of violence are allowed to be committed with impunity, and how to most effectively memorialise atrocities from the past. It’s been a while since the International Conference on Ethiopian Studies in Dire Dawa, but we just received a copy of the resolution regarding the Graziani memorial that was passed there and thought we should share – see below, and see our own comment on the issue here. The 18th International Conference of Ethiopian Studies was held in the eastern Ethiopian city of Dire Dawa from 29 October to 2 November 2012. The conference brought together three hundred scholars from twenty-six countries from all over the world. It was the latest in the series of conferences first held in Italy in 1959. Screenshot taken from video. Copyright: FOX Inc.
As a child of the 80s and 90s growing up in North America, I was rather accustomed to hearing about Ethiopian conflict and famine on the news. However, one afternoon while my mother was watching The Young and the Restless in the living room, something caught my ear. A character casually suggested that the couple head to an Ethiopian restaurant for dinner. My adolescent mind was blown. How did the writers hear about Ethiopian food?! And who among them had the gumption to actually try it? Oh, and I sure hope they didn’t see the kitfo! Hitherto, I had only known Western and Ethiopian social spaces to exist separately, and the notion that the two could overlap truly fascinated me. On November 13, 2011 an episode of The Simpsons aired, entitled “The Food Wife“. It featured a 3.5-minute segment where the family wearily stumble upon a Little Ethiopia enclave, but eventually find that they thoroughly enjoy the tastes and textures of Ethiopian cuisine. As foolishly entertaining as the show can be, The Simpsons is both a repository and icon of American pop culture and often provides great analyses on issues of contemporary global importance through satire. There’s much to learn from that two dimension dysfunctional family. The following lines are taken from the opening scene of the segment, where Marge is horrified when her car breaks down in a dark and seedy part of town. Marge: “Nowhere scary” [as she hurriedly locks the car doors].